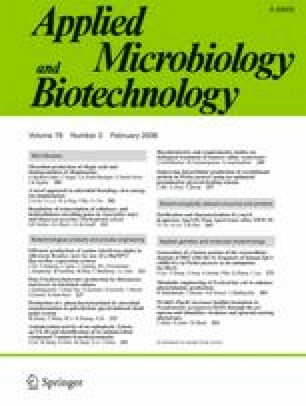 High poly(3-hydroxybutyrate) (PHB) content and volumetric productivity were achieved by fed-batch culture of Halomonas boliviensis using a defined medium. Initial shake flask cultivations in a minimal medium revealed that the growth of H. boliviensis was supported only when the medium was supplemented with aspartic acid, glycine, or glutamine. Addition of 0.1% (w/v) glutamine in the medium resulted in the highest cell dry weight (CDW; 3.9 g l−1). Glutamine was replaced by the less expensive monosodium glutamate (MSG) in the medium without any notable change in the final cell density. Effect of initial concentrations of NH4Cl and K2HPO4 on cell growth and PHB accumulation by H. boliviensis was then analyzed using a fed-batch fermentation system. The best conditions for PHB production by H. boliviensis were attained using 0.4% (w/v) NH4Cl and 0.22% (w/v) K2HPO4 and adding MSG intermittently to the fermentor. Poly(3-hydroxybutyrate) content and CDW reached 90 wt.% and 23 g l−1, respectively, after 18 h of cultivation. In order to increase CDW and PHB content, MSG, NH4Cl, and K2HPO4 were initially fed to the fermentor to maintain their concentrations at 2%, 0.4%, and 0.22% (w/v), respectively, and subsequently their feed was suppressed. This resulted in a CDW of 44 g l−1, PHB content of 81 wt.%, and PHB volumetric productivity of 1.1 g l−1 h−1. The authors would like to thank the Swedish International Development Cooperation Agency (Sida) for supporting this work.